Get Well Soon Angel or Thank You Angel Pins Gold. Attach to a card, gift, hat or lapel. The carded pin stands 1 inch tall and is 3 dimensional in gold tone. Each pin includes a clutch back, angel card and individually poly bagged. 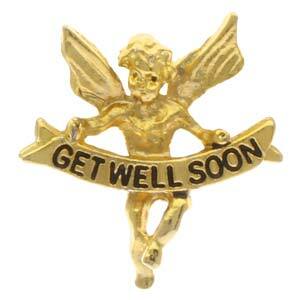 Let someone you care about know you are thinking of them with our “Get Well Soon” lapel or hat pin. 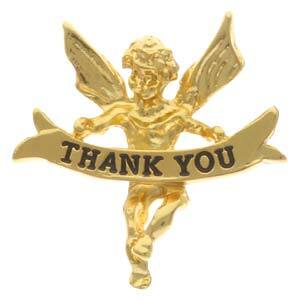 The Thank You pin is a great for recognizing donors, volunteers, or anyone who deserves a special "Thank You".